Recently I've written to you about the lives of some super stylish women. But what about the gentlemen? Of all the men I could imagine for my Mavens & Mavericks post this week, Yves Saint Laurent topped my list. Why? Quite simply, because he did it all. At the age of 21, Yves Saint Laurent became Christian Dior's successor after Dior died suddenly of a heart attack in 1957. Saint Laurent's first collection for Dior revived the house and instantly ushered in a new, iconic silhouette: the trapeze. Soon, however, Saint Laurent's designs became too radical for the old school chairmen of Dior. Sadly, he was conscripted into the French Army to fight in Algeria, and suffered a nervous breakdown. At the same time, Saint Laurent learned that Dior had fired him. Despite these dark years, in 1962 Saint Laurent founded his own label with life and business partner, Pierre Bergé. And so began an impressive list of fashion firsts, most famously a women's tuxedo, 'Le Smoking', created in 1966. He was also the first designer to feature models from diverse ethnic backgrounds in his campaigns and shows, and the first to produce a full ready-to-wear collection. In 1971 Saint Laurent used the 1940s for his inspiration; it is now a given that styles from the past are reworked in high-end collections. 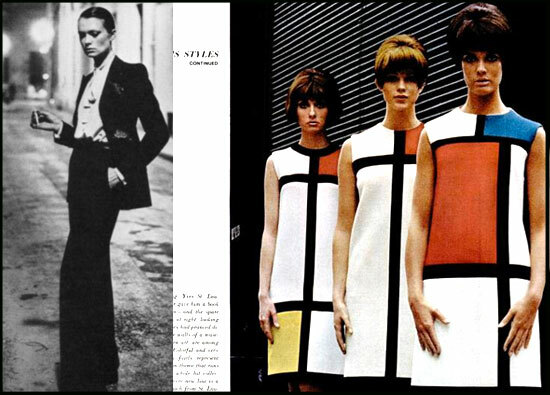 Saint Laurent looked to art for inspiration, most notably in his famous Mondrian dress from 1965. He also had an impressive list of muses, including Iman, Catherine Deneuve and Loulou de la Falaise. In 1983 Saint Laurent became the first living designer to be given a museum exhibition, curated by none other than Diana Vreeland. Saint Laurent died in 2008. Tragically, he and partner Pierre Bergé had been joined in a civil union only a few days prior. During their life-time together they amassed one of the century's greatest art collections, which Bergé sold in a momentous Christie's auction at the Grand Palais in Paris in 2009. If you ask me, it's one of the greatest (and most stylish) love stories of the 20th century.